Laminate everything from a business card to a large map of the world. Using the laminating roll allows individuals to protect documents of various sizes, while creating a professional-look in minutes. The sister product to our Cleer Adheer Sheets. These rolls offer the same professional looking quality but for larger applications. Cut the exact size you need each time. Perfect for posters and maps - no job is too big or too difficult. Each roll comes on a 2 1/4 core. Heavyweight. 24 inch wide roll x 600 inches long. Hi, I'm John with C-Line and today we're going to talk about our Cleer Adheer Laminating Roll. This do-it-yourself laminating film comes in a giant 24" x 600", which makes it perfect for laminating larger items like maps and signs. With this continuous roll, you get 50' of 24" laminating film that can be cut to size to fit your documents, charts, pictures and more. No heat or special equipment is needed and it's easy to use. Here's all you do. Because the film is on a roll, it may help to secure it with some masking tape. Line up the item you want to laminate using the grid pattern on the back. Trim along the gridlines to get the perfect size sheet. Now, simply peel off the split-back liner and carefully lay your document, print side down, on the adhesive portion of the film. I like to start at one end and let the paper roll out over the film. Make sure to smooth out any air bubbles. You want to be careful because once stuck, the paper cannot be repositioned. For single sided lamination, just trim the edges and you are finished. For double sided lamination, simply repeat these steps with the back side of the document, using more laminating film and trim if necessary. Now your document is completely sealed and protected. 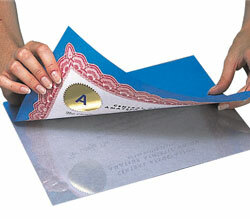 Cleer Adheer Laminating Film provides waterproof, tear resistant, permanent protection. There are hundreds of uses for this versatile product at your home, school and business. Order yours now! That's all we have for today. I'm John with C-Line. Thanks for watching.